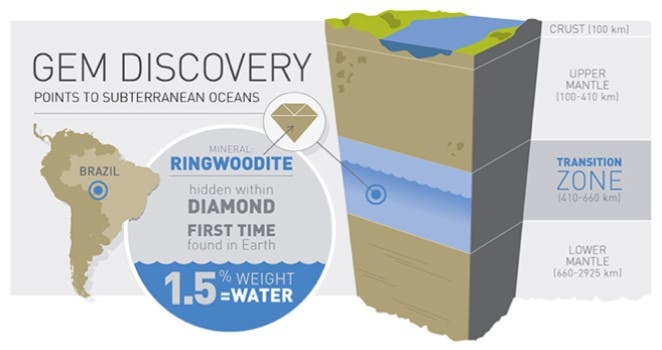 The first ever terrestrial discovery of ringwoodite seems to confirm the existence of massive amounts of water hundreds of kilometers below the Earth’s surface. Let me explain how. Ringwoodite is a high-pressure polymorph of olivine; it’s basically olivine, but with a different crystal structure. The mineral is thought to exist in large quantities in the so-called transition zone, 410km to 660 km deep. Judging by its properties and lab experiments, crystallographers believe that the mineral is restricted between 525 and 660 km deep. Ringwoodite has been found in meteorites, but until now, no terrestrial sample has ever been unearthed because, well, geologists can’t go 500 km deep underground. 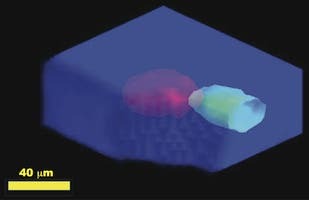 However, a University of Alberta diamond scientist has found the first terrestrial sample. 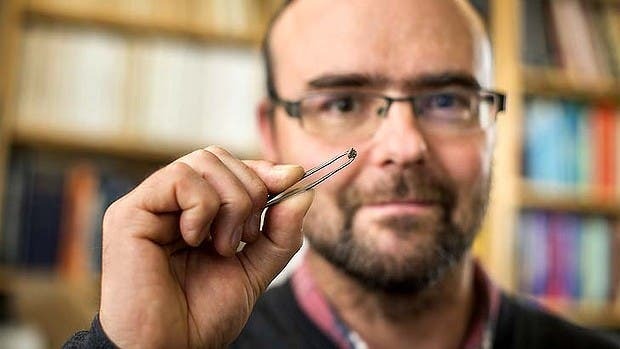 The team led by Graham Pearson, Canada Excellence Research Chair in Arctic Resources analyzed this ringwoodite sample and reported that it contains a significant amount of water – 1.5 per cent of its weight. Since this mineral is thought to be found in enormous quantities in the transition zone, that means that the equivalent of all the surface water is found inside the minerals. Interestingly enough, the mineral is notable for being able to contain water within its structure, present not as a liquid but as hydroxide ions (oxygen and hydrogen atoms bound together) . This has huge implications because ringwoodite is thought to be the most abundant mineral phase in the lower part of Earth’s transition zone, so abundant that its properties directly affect those of the mantle – so the existence of water is quite a game changer. Pearson holding the sample. Remember that the ringwoodite inclusion is a very small part of the sample. The sample was found in 2008 in the Juina area of Mato Grosso, Brazil, where artisan miners unearthed the host diamond from shallow river gravels. Diamonds are most often associated and brought to the surface by minerals called kimberlites – the most deeply derived of all volcanic rocks. But the discovery itself was almost accidental. Pearson’s team was looking for something entirely different when they stumbled onto a three-millimetre-wide, dirty-looking, commercially worthless brown diamond. The ringwoodite itself is invisible to the naked eye, and hidden beneath the surface, so it’s a surprise that graduate student, John McNeill, found it in 2009. It took years of analysis and redoing the tests over and over again before it was finally confirmed that the sample is ringwoodite; infrared spectroscopy and X-ray diffraction confirmed this, while the critical water measurements were performed at Pearson’s Arctic Resources Geochemistry Laboratory at the U of A. Aside from actually finding the sample, it’s also notable how this study came to fruition. It is a remarkable example of ome of the top leaders from various fields, including the Geoscience Institute at Goethe University, University of Padova, Durham University, University of Vienna, Trigon GeoServices and Ghent University. For Pearson, one of the world’s leading authorities in the study of deep Earth diamond host rocks, this is one of the most notable discoveries in his career, apparently confirming 50 years of theories. Geophysicists and seismologists have long theoretized that the composition of the transition zone has to feature immense quantities of water, but that was never confirmed – until now. 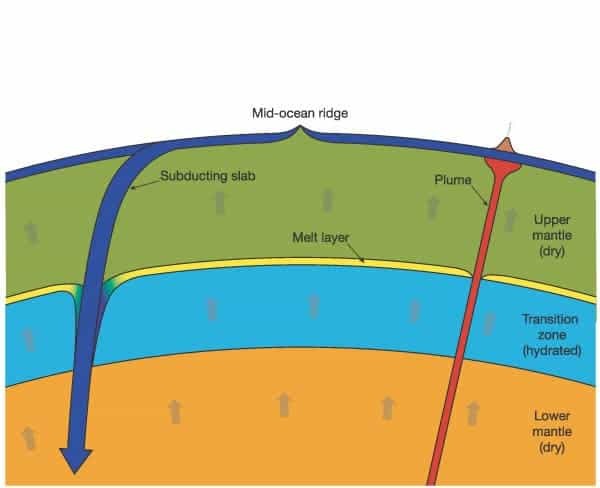 The existence of water in the ringwoodite in the transition zone has immense implications for volcanism and plate tectonics, affecting how rock melts, cools and shifts below the crust.